January 12th will mark the year anniversary since the devastating earthquake in Haiti brought down its city, communities and people. 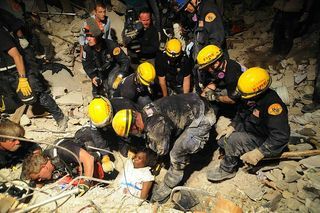 Immediately after the earthquake, aid from all over the world rushed in to pull potential survivors from the rubble and to help with the physically and emotionally wounded. Medical response teams were usually followed by teams of mental health workers with the mission to ease psychological caused by the disaster. There has been a good amount of recent research about Post Traumatic Stress Disorder (PTSD) and disasters. But an article published in the December issue of Psychological Science in the Public Interest offers another viewpoint: the field may be able to be far more effective if there is a shift in how mental health workers see their roles in helping after a disaster. 1. People who have survived disaster will present psychological problems which include PTSD, depression, anxiety, grief and even thoughts of suicide. This will happen within 30% of adults and youth shortly after the disaster. 3. Resilience and recover was found to be related to a number of variables. This includes the social and economic state of the area prior, during and after the disaster; where individuals are located when the disaster strikes; and what if any resources they had that were lost due to the disaster. 4. Disaster puts the fiber of the community at risk. The links between families, neighborhoods and entire communities are often shredded after a disaster. When these links are broken, individuals lose a vital source of immediate support in times of pain and suffering. 5. Those that live far away from the disaster can suffer from some distress. This is often related to the loss of a loved one who lived in the disaster area, or if they previously suffered from mental or spiritual distress before the disaster happened. Not everyone is going to respond the same way to trauma, but in the effort to find a way to help the field has focused on categorizing emotional response rather than embracing it as a part of the experience. This study suggests that there is too much focus on the “dysfunction and psychopathology” in the aftermath of traumatic events. In our effort to understand the psychological consequences of social tragedy, psychology’s focus has been pointed squarely at treating the individual instead of rebuilding the community’s well being. Rollo May urged practitioners to be willing to “enter the worlds of their clients.” In this case it may be more helpful to not only enter the world of the individual but their community as well. We cannot forget that we are working with human beings who have their own beliefs, ways of living and perceptions. May urged therapists not push clients to fit a therapeutic approach … and that’s as applicable to the western ideas of PTSD and trauma as it is to neuroses and anxiety. Western medicine’s individualistic approach to therapy may not offer the support to people around the world that traditional communities do. Individual interventions are useful, but the researchers suggest that effective community outreach and education efforts are also needed. Restoring community and families may be the most potent tool for healing after a disaster. Sociologists, economists, political scientists, community leaders and healers can come together to rebuild not just the buildings but the people as well.